You can use PROC SURVEYREG to perform domain analysis in a subgroup of your interest. To illustrate, this example uses a data set from the National Health and Nutrition Examination Survey I (NHANES I) Epidemiologic Followup Study (NHEFS), described in Example 113.2 in Chapter 113: The SURVEYPHREG Procedure. The NHEFS is a national longitudinal survey that is conducted by the National Center for Health Statistics, the National Institute on Aging, and some other agencies of the Public Health Service in the United States. Some important objectives of this survey are to determine the relationships between clinical, nutritional, and behavioral factors; to determine the relationship between mortality and hospital utilization; and to monitor changes in risk factors for the initial cohort that represents the NHANES I population. A cohort of size 14,407, which includes all persons 25 to 74 years old who completed a medical examination at NHANES I in 1971–1975, was selected for the NHEFS. Personal interviews were conducted for every selected unit during the first wave of data collection from the year 1982 to 1984. Follow-up studies were conducted in 1986, 1987, and 1992. In the year 1986, only nondeceased persons 55 to 74 years old (as reported in the base year survey) were interviewed. The 1987 and 1992 NHEFS contain the entire nondeceased NHEFS cohort. Vital and tracing status data, interview data, health care facility stay data, and mortality data for all four waves are available for public use. See http://www.cdc.gov/nchs/nhanes/nhefs/nhefs.htm for more information about the survey and the data sets. For illustration purposes, 1,018 observations from the 1987 NHEFS public use interview data are used to create the data set cancer. The observations are obtained from 10 strata that contain 596 PSUs. The sum of observation weights for these selected units is over 19 million. Observation weights range from 359 to 129,359 with a mean of 18,747.69 and a median of 11,414. Suppose you want to study how aging affects body weight in the subgroup of cancer patients for the base year survey population. Because whether an individual has cancer or not is unrelated to the design of the sample, this kind of analysis is called domain analysis (subgroup analysis). 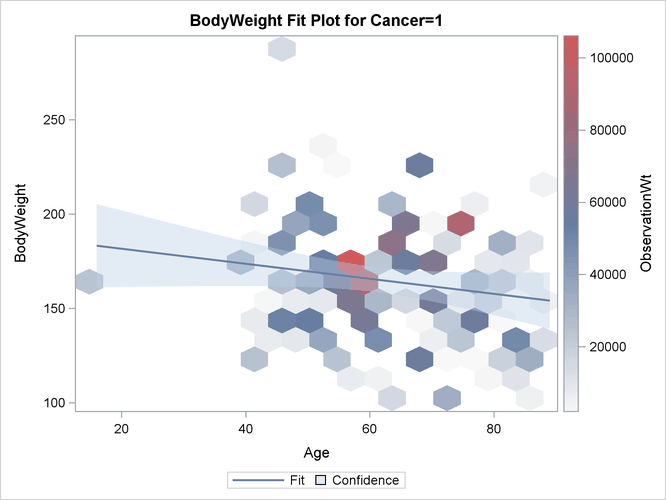 The following statements request a linear regression of BodyWeight on Age among cancer patients. The STRATA, CLUSTER, and WEIGHT statements identify the variance strata, PSUs, and analysis weights, respectively. The DOMAIN statement defines the subgroups of people who have been diagnosed with cancer and people who do not have cancer. The ODS SELECT statement requests that PROC SURVEYREG display only the analysis in the subgroup Cancer = 1 in the output. The PLOT= option in the PROC statement requests that weights be represented as a heat map with hexagonal bins. Output 114.7.1 gives a summary of the data and the parameter estimates of the linear regression in domain Cancer = 1. The analysis indicates that aging does not significantly affect body weight among cancer patients. Note: The degrees of freedom for the t tests is 586. When ODS Graphics is enabled and the model contains a single continuous regressor, PROC SURVEYREG displays a plot of the model fitting, which is shown in Output 114.7.2.